Throughout April all shortlisted schemes will be visited by the judging panel before the winners of are announced at a ceremony on May 17 at the Ulster Museum, Belfast. This building – a rare example of 20th-century Northern Irish architecture of international repute – was designed by the London office of Francis Pym from 1963 with the integral assistance of Portaferry man Paddy Lawson. The extension went on to win a RIBA award in 1972. 12th century castle remaining in the ownership of the Rowan Hamilton family. The castle has been extensively repaired in line with architectural conservation principles. The restoration of the ship, pumphouse and dock is a project to create an international visitor destination in Belfast’s docks. HMS Caroline dating from 1914 is the last surviving ship from the Battle of Jutland and has been restored as a floating museum. The transport hub is the west Belfast terminus for the Glider and along with the new square will act as the focal point for further regeneration in Colin Town Centre. City Quays 2 is the second speculative commercial office building that forms part of a wider development of Belfast Harbour around Clarendon docks. The £15m building provides eight stories of flexible workspace. This is new facility for the radio station which serves the Gaelic speaking community across Ulster and beyond. The building, which includes a café, exhibition space and garden, brings ‘front door’ activity back to Divis Street in Belfast. Barn style house in County Down designed to meet the accommodation needs of a semi-retired couple and their children who would stay on the occasions when they visit. A social housing project, developed following a design competition involving 12 practices, in south Belfast. The building provides 15 apartments. Refurbishment of existing house and extension to create a 5-bedroom family home in South Belfast. Ciarán Fox, Director of the Royal Society of Ulster Architects (RSUA), said, “This year’s shortlist is brilliantly diverse with no two projects alike. From a distinctive local transport hub to the restoration of a ship from the first world war, there is much to celebrate. 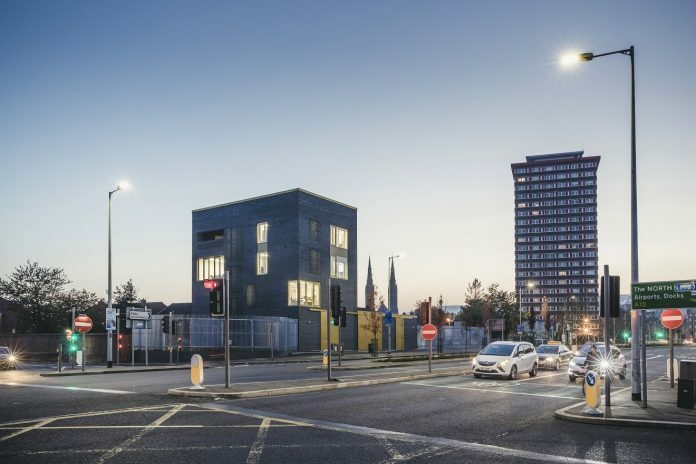 Northern Ireland always has some remarkable housing projects but it is great to see a social housing project make this list, reflecting a new focus by housing associations on architecture. “The last two years have been challenging for architects seeking to deliver the best value to society in Northern Ireland. There have been quite a few sizeable commercial projects where perhaps design quality was not a major consideration for the client. A number of significant publicly funded projects have stalled and many of those that have proceeded have sought design on the lowest fee basis. In that context, the clients, architects, other consultants and builders involved in these shortlisted projects are to be particularly commended. All of the shortlisted buildings are potential RSUA Design Award winners. If they are successful, they will be in the running to win the Liam McCormick Prize – the award for Northern Ireland’s building of the year – and will be considered for a UK-wide RIBA National Award in recognition of their architectural excellence, the results of which will be announced in June.